The Washington Capitals head to Canadian Tire Centre to take on the Ottawa Senators on Thursday, October 5, 2017. The opening line for this contest has the Capitals at +110 and the Senators at +215. Washington had a record of 55-19-8 last year and away from home they had a record of 23-12-6. They were 1st in the Metropolitan Division. They tallied 263 goals and surrendered 182 goals for a point differential of +81. For the year they had an ATS mark of 62-33-0 and an over/under record of 43-38-0. Ottawa finished with a record of 44-28-10 including 22-11-8 on home ice last year. They were 2nd in the Atlantic Division. They scored 212 goals and gave up 214 for a goal differential of -2. Their record against the spread was 55-46-0 while their over/under mark was 39-52-0. Braden Holtby had 42 wins and 13 losses last season in goal for the Capitals. He had 1,690 shots against him and he surrendered 127 goals. He made 1,563 stops for a save percentage of 93%. Nicklas Backstrom scored 85 total points last year for the Capitals. He had 23 goals last season with 160 shots on net giving him a shooting percentage of 14%. He had a total of 62 assists on the year and averaged 18.3 minutes played per contest. 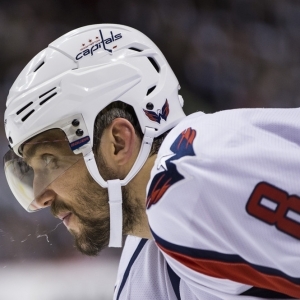 Alex Ovechkin averaged 18.4 minutes of ice time per game last season. In that time he had a shooting percentage of 11% by tallying 33 goals on 305 attempts. He had 35 assists giving him a total of 68 points on the year. Mark Stone had 52 total points last season for the Senators. He had 22 goals last year with 132 shots on goal giving him a shooting percentage of 17%. He had a total of 30 assists on the year and averaged 18.6 minutes played per contest. Craig Anderson had 25 wins and 11 losses last season in net for the Senators. He had 1,247 shots against him and he gave up 92 goals. He made 1,155 saves for a save percentage of 93%. Mike Hoffman averaged 17.6 minutes of ice time per contest. In that time he had a shooting percentage of 11% by scoring 25 goals on 219 attempts. He had 35 assists giving him a total of 60 points on the year. The Capitals gave up 272 power play opportunities and surrendered 44 goals on those chances for a penalty kill percentage of 84% last season. That was 7th in the league. They averaged 30 shots per contest and as a team shot 10.54% for the year. They allowed 28 shot attempts to their opposition per game and had a team save percentage of 92%, ranking them 2nd in the NHL at stopping the puck. The Capitals were 1st overall with 118 total points last year. They were 3rd in the league with 263 goals and 30th in goals allowed with 182. They had 248 power play chances and scored 57 goals on those opportunities for a percentage of 23%. That was 4th in the NHL. As a team, the Senators were 22nd with a total of 212 goals scored while they were 20th with 214 goals surrendered last season. They averaged 30 shots per game and had a team shooting percentage of 8.61%. As a unit they gave up 30 shots per contest and had a save percentage of 92%, putting them 8th in the league. The Senators had a total of 98 points last season, which was 12th in the NHL. They had 43 power play goals on 254 chances for a percentage of 17%. That was 24th overall. They gave up 247 power play opportunities and surrendered 50 goals on those chances for a penalty kill percentage of 80%, ranking 21st when short-handed. Washington was 10th in the NHL in Corsi percentage last year with 51.4%, as they attempted 4,635 shots on net at full strength while they gave up 4,377 shots on net in the same situations. Their Fenwick percentage was 51.6% as they had 3,487 attempts while they gave up 3,275 shots on the defensive end. That ranked them 6th in the league. The Capitals started possessions in the offensive zone 52% of the time, which was 12th in the league, while their defensive zone percentage was at 48% for the season. That was 22nd overall in the NHL. They had 2,385 face-off wins compared to 2,400 losses, meaning their face-off win percentage was 49.8%. That ranked them 17th in the league. On defense Washington had 1,727 hits and they blocked 1,102 shots from the opposition, putting them 21st overall. The Senators started possessions in the offensive zone 52.2% of the time while their defensive zone percentage was at 47.8% for the year. That ranked them 11th and 21st respectively in the NHL. They had 2,549 face-off wins as opposed to 2,452 losses, meaning their face-off win percentage was 51%. That was 10th in the league. On defense Ottawa had 2,114 hits and they blocked 1,352 attempts from opposing offenses, ranking them 3rd in blocked shots. Ottawa was ranked 26th in Corsi percentage with 48.3% as they tried 4,550 shots on goal while at full strength while they surrendered 4,863 shots on net when they had a full team on the ice. Their Fenwick percentage was 22nd in the NHL at 49%, as they had 3,380 shots while they gave up 3,511 attempts on defense.